It seems like both a long and a short time since graduation. This is a synopsis of how I spent it. 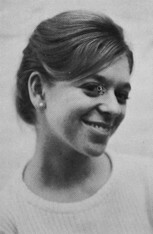 I went from Swarthmore to Penn Law School (JD, 1970), where I met my first husband, Tom McGrew. We married in 1968, divorced in 1986; he died in 1995. We went to Washington DC to practice law, and I became a partner at Steptoe & Johnson in 1976. In the meantime, I had two children, Jessica and Ben -- they are, of course, the best part of my life. After two years as the HUD General Counsel under President Carter, I spent two more years at Steptoe before starting my own firm, that morphed into Sprenger & Lang in 1989. I married my law partner, Paul Sprenger, in 1990 and acquired three stepchildren (Steve, Heidi and Sara). Our law practice was devoted to employment discrimination class actions on behalf of women, minorities and older workers. It was a very heady, exciting, successful and draining business. Gradually, we both retired into other pursuits. I founded the Atlas Performing Arts Center on H Street NE in 2001 and spent the next 15 years renovating and then launching the venue. It is an iconic landmark (on the National List of Historic Places) on a corridor that burned in the 1968 riots (90 buildings were razed). Since then, H Street NE has become a "hot" redevelopment area. The day after I stepped down as board chair of the Atlas, my husband drowned -- presumably triggered by a heart attack -- while we were snorkeling in the Caribbean. Thus my life has undergone another major change in the past two years. I moved to Capitol Hill where I live in a townhouse with my dog, Pippin. I am slowly exploring what I want to do next, in addition to serving as Chair of the Eugene M. Lang Foundation. My children, stepchildren and grandchildren are ever more central to my life. I also oversee the care and affairs of my father, Eugene Lang, who is 98 and has advanced Alzheimer's Disease, and of my aunt, who is 96 and suffers from advanced dementia. As my mother used to say, everyone has something. I'm grateful for my own good health (sciatica and back pain notwithstanding) and I'm amazed by my extraordinary good fortune in every part of my life. Though it is a bit startling to be turning 70. Jane Lang has a birthday today. Jane Lang updated her profile. View. Jane Lang added a photo to her profile gallery. New comment added.